#160345 New Fully Automatic Stick Pack Machine, Model MM99-101S. This stick pack machine features a cycle speed of up to 50 cycles per minute. 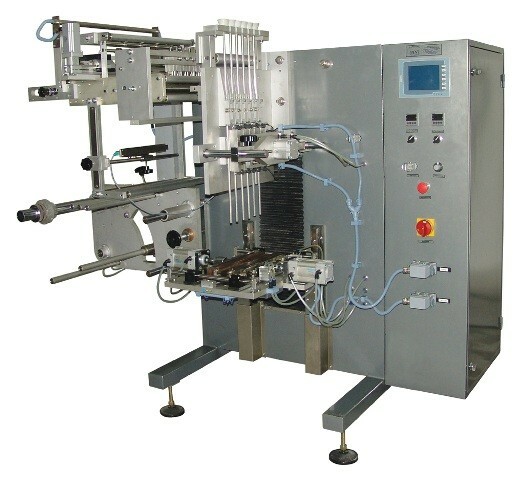 Depending on the size of the film width will determine the number of lanes per Stick Pack Machine, can go up to 8 lane.. The machine is suitable for all products and can be supplied with either a volumetric cup filler for granules, an auger feeder for powders or a pump for liquids and creams. Stick Length: Adjustable up to 300mm, Max Film Diameter: 350mm, Film Roll Core: 75/76mm, Machine Dimensions: Length 1220mm x Width 1210mm x Height 1470mm. Electrical: 3Ph/60Hz/220Volts. Air required. Delivery: approx 8-10 weeks.